Shannon plays Curtis LaForche, a blue-collar worker and family man living in small town Ohio. As his friend and co-worker Dewart (Shea Whigham) insists, Curtis has a great life. But Curtis doesn’t feel that way. He loves his family and seems content with his job, but his thoughts are consumed by something else: rain. It showers a lot in this town, with each storm getting progressively worse than the last. Every drop, each clap of thunder, the strange bird formations; even the smallest hint of a cloud in the sky unsettles Curtis. And then there are the dreams. Every night, something horrific happens to himself or his young daughter involving people, animals, or objects from his life, and when he wakes up, he begins to fear whatever hurt him in the dream. Convinced there is an oncoming reckoning, he takes out a loan and begins to drastically expand the tornado shelter behind his house while his wife Sam (Jessica Chastain) observes with fear and disbelief. The film doesn’t mean to keep the audience in the dark about Curtis’ fears and actions: even he acknowledges there may be something wrong in his head, and we learn early on that his mother was diagnosed with paranoid schizophrenia in her thirties. Instead of centering the story around a twist reveal, it takes mental illness very seriously, putting us inside the mind of a man who is aware reality is crumbling around him, even if he struggles to admit that to himself. Curtis grapples with two kinds of terror in the film: the horrors that plague his dreams and work their way into his waking hours, like the storms, and the even bigger fear that his growing paranoia could be indicative of insanity. So great is this fear that even while he tries to get therapy, he desperately hangs on to his paranoia, a kinder alternative than losing the comfort of a sane mind. Curtis’ story is told so effectively that we sympathize with him every step of the way. Losing one’s grip on reality is one of the most terrifying things I can imagine, and the film illustrates this with a dark, haunting beauty that is impossible to shake off even after leaving the theatre. The narrative maintains a strict point-of-view on Curtis, and since we share in his fear, it’s easy to understand the decisions he makes, even if they are rarely the right ones. The shelter, for instance, jeopardizes is family and finances, but as a vindication of his dark thoughts, he needs it in a way even he can’t quite comprehend; at a certain point, the viewer wants to run and hide in that shelter just as much as Curtis does. I haven’t yet seen a better performance this year than Michael Shannon’s remarkable turn as Curtis. The key to his work here is that he always plays Curtis as a good man, a wholesome person thrust into a terrible situation. There are so many different sides to the character, but Shannon keeps them all in check by maintaining a great sense of humanity, and in that way, we love and fear for Curtis more and more as his condition worsens. Shannon has demonstrated his nearly unrivaled capacity for nonverbal expression in other roles, but that talent is put to better use here than ever before, as his face so often tells a different story than his words. Just look at how fright envelops Shannon’s face as he explains his dreams to a Doctor, or how his tormented visage reflects a shattered soul when he confesses the origin of his actions to his wife. This is the rare performance that just gets better and better with each passing moment; by the end, Shannon has created a fully palpable three-dimensional character, and that, more than anything, contributes to film’s dramatic success. The very busy Jessica Chastain, in her seventh role of 2011, is wonderful as Curtis’ wife Samantha; just as Shannon is carving out a nice niche for himself playing tortured characters on film and on TV via “Boardwalk Empire,” Chastain continues to prove that when it comes to playing the supportive yet complex wife and mother, there’s no one better. She gets to deliver the powerful dénouement in the film’s excellent climax, and between this and “Tree of Life” alone, Chastain an excellent number of shots at Oscar gold this winter. Rounding out the LaForche family is Tova Stewart as their six-year-old daughter Hannah, whose deafness provides both a conflict for the family and a thoughtful counterpoint to the extreme role sound plays in Curtis’ visions. Sound is integral to the movie as a whole, actually, and director Nichols pays special attention to how variations in the amount of diegetic noise can color a scene. David Wingo’s musical score, meanwhile, is awe-inspiring, a hauntingly moody work that gradually reveals a vast emotional palette. The cinematography by Adam Stone is often breathtaking, capturing and conveying the paranoia, fear, atmosphere, and absolution that exists in the world Curtis sees. There is only one portion of the film that didn’t work for me, and that’s the ending. About five minutes before the credits actually role, Nichols reaches a perfect stopping point. This moment is the ultimate resolution of Curtis’ arc, the only ‘ending’ that matters in the context of this character. Instead, the film continues awkwardly towards a conclusion that, while not bad by any means, works on a different level of ambiguity than the rest of the film and hammers home a point made redundant by the earlier, more emotionally resonant scene. Oh well. It’s a fumble, but not a terrible one; the ending in no way weakens the strength of the story. This is powerful, provocative filmmaking, scary in the subtle and thoughtful ways it examines one of the most real terrors of mankind. 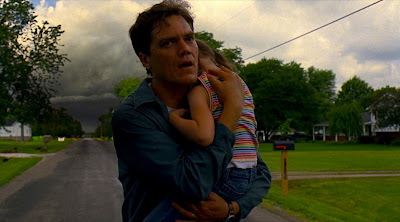 As films dealing with mental illness go, “Take Shelter” is one of the best; the Oscars Ron Howard and company inexplicably won for “A Beautiful Mind” should be rescinded and given to this picture, while those looking for true, effective horror should seek out this film and leave “Paranormal Activity” behind. “Take Shelter” is currently playing at the Landmark Mayan in Denver and in limited release around the country.